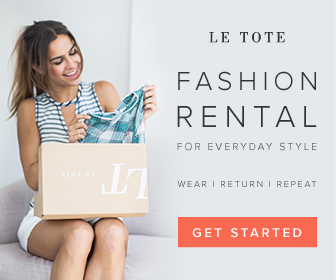 Dry vs. Dehydrated Skin | What's the Difference? The amount of moisture in your skin dictates which products are used during your skin care regime. But many of us fail to realize that too little hydration in our skin can mean two things: an ongoing skin issue known as “dehydrated skin” or a temporary occurrence called “dry skin” which is caused by environmental factors. So how do you know whether you have dry or dehydrated skin? Both can leave skin feeling dry, tight, flaky, itchy, and irritated. Dry skin has an absence of oil or lipids. While with dehydrated skin, there's an absence of water in the stratum, which is the top layer of the skin. 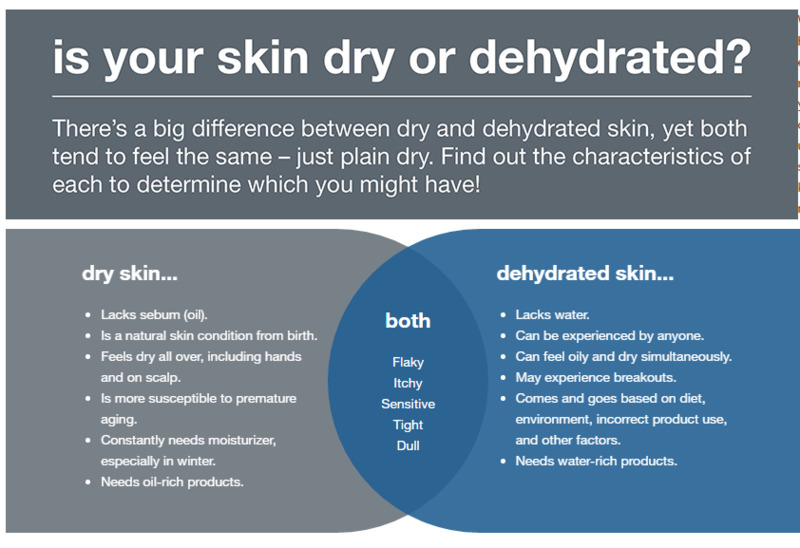 The below infographic from Dermalogica.com illustrates this difference between dry skin and dehydrated skin. The sun can make the skin dehydrated. Sun is the main factor that can affect our skin, increase the aging process, increase oxidants in the skin, dehydrate it and increase free radicals in the cells, damaging the skin. Hard water contains limestone, which can remove water from the skin. You can have a shower every day, but make it a short shower, and stick to water that's warm rather than hot. Hot showers and baths can make the skin more dehydrated. It's a factor in many skincare issues, and dehydrated skin is no different. As your skin gets older, you may find it more difficult to keep its moisture levels high. The aging process makes our bodies more dehydrated, including the skin, Structural changes associated with the aging process cause more dehydration. It can create a slow-down of cell turnover. And when skin becomes dehydrated, it can start to look older, too. Dehydrated skin will have a rough-feeling texture, with fine lines becoming more prominent. While air conditioning and heating can make the temperature more comfortable during hot or cold weather, they could be doing more harm than good to your skin. Air conditioning and central heating can affect the skin's hydration. If you're using products that are too harsh, or too light, or if you're using them infrequently, your skincare products could be contributing to your dehydrated skin concerns. If you’re spending your hard-earned money on skin care products designed to moisturize and hydrate the skin, don’t you want to make sure you’re getting your money’s worth and that the product is actually effective? One amazing and innovative way to test your skincare products to see if they are actually moisturizing your skin effectively is with a skin moisture monitor. 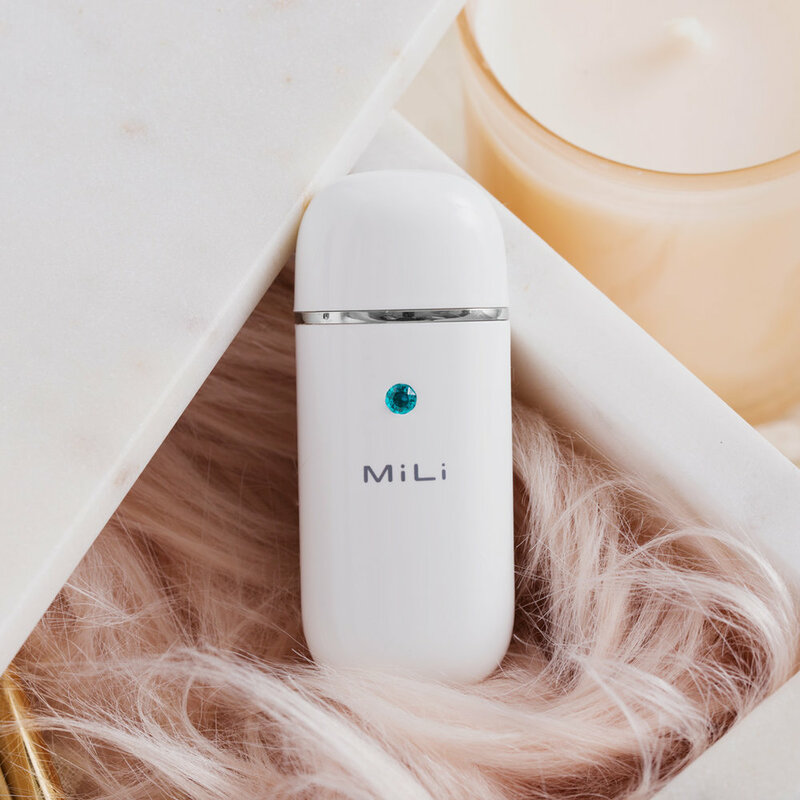 The MiLi Pure Skin Moisture Monitor does just that! 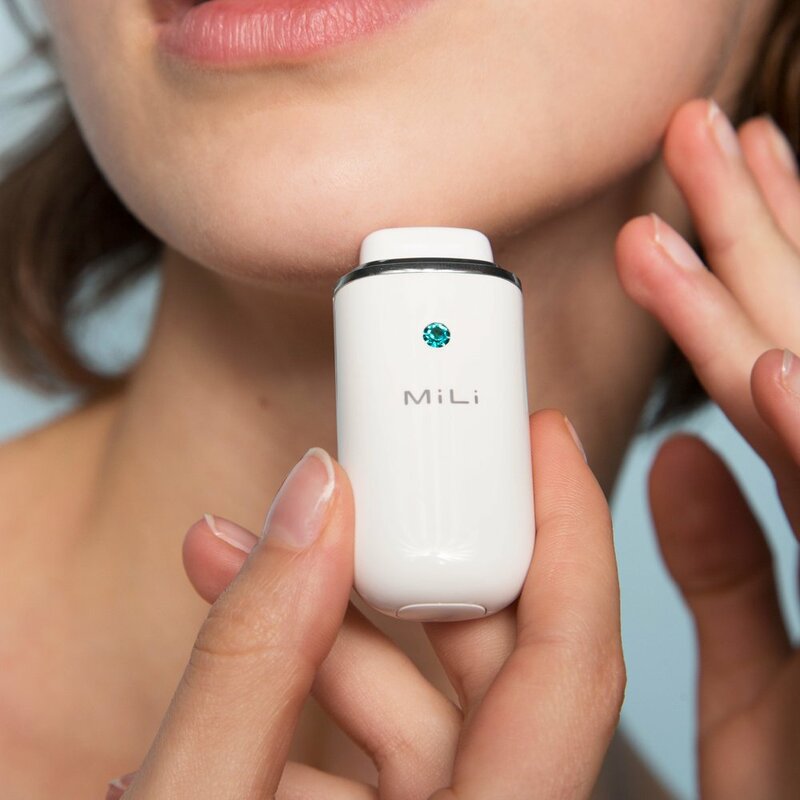 The MiLi Pure Skin Moisture Monitor is a portable skin moisture detector that works with your iOS or Android device*. This dehydration analyser tool tests your skin’s moisture levels before and after using your skincare products and it only takes seconds! This allows you to keep track of changes over the weeks, months and years and will let you know if your skincare products are actually hydrating your skin or if you need to reevaluate your products or skincare regimen. You can test the condition of your face, neck, eye area and hands instantly. The MiLi Pure is the perfect investment for those who value healthy, hydrated skin. This skin moisture analyzer is also really chic and stylish – the devices have beautiful Swarovski crystals embedded into the design. There is so much joy in never having to wonder if your skincare serum, moisturizers and night creams are actually working! 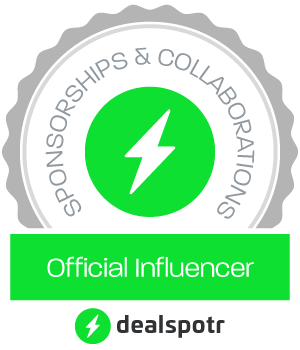 *Compatible with iOS7 or above, Android 4.3 or above and any other Bluetooth 4.0 device.